You can still enter the commenting challenge! Come join us in commenting on 10 blogs every day through July 11 (which funnily enough is my birthday! That was not planned!)!!! Just click here! I LOVE peanut butter and chocolate together. It is probably my favorite food combination EVER! So when I saw a recipe on Nestles Our Very Best Baking site for Peanut Butter Brownies I wanted to try it - BUT I didn't have time to make the brownies from scratch. 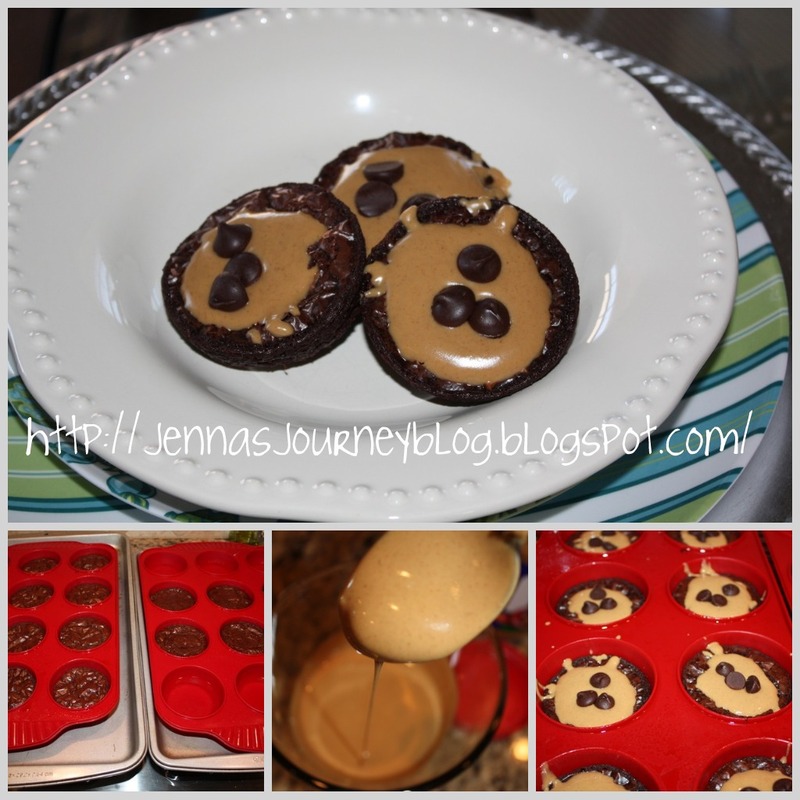 So here is MY version of PB Brownie Cups! Prepare brownie mix according to box directions. Scoop into muffin tins (mine are silicone - they come out much easier). For one box of brownie mix you'll get between 12 and 18 cups. Next time I make these I'll divide just into 12 cups. *Note, if you don't have enough to fill a second pan, fill the empty cups with some water to ensure even baking for that pan. Or at least, that's what Mom always does so I do it too. Bake for about 18=20 min's, or until a toothpick inserted into the center of a brownie comes out mostly clean, but still a little wet. Wait for the centers to fall. If they don't (and most of mine didn't) just use the back of a teaspoon and make yourself a small hole (don't go all the way through the brownie). Microwave your peanut butter for 45 seconds. Stir. Place a heaping tablespoon into the center of each brownie. Next, I placed 3 large dark chocolate chips in the center of each brownie. Let cool COMPLETELY on a wire rack. If they aren't completely cooled they will fall apart! Handmade toys are the best. Girl's Night Out & FNL! The Vets or the Newbies? The End = and a Birthday! 2nd Annual Commenting Challenge - Starts NOW!